IBM announced that researchers at its Almaden Research Center have demonstrated magnetic resonance imaging (MRI) techniques to visualize nanoscale objects. This technique brings MRI capability to the nanoscale level for the first time and represents a major milestone in the quest to build a microscope that could "see" individual atoms in three dimensions. Using Magnetic Resonance Force Microscopy (MRFM), IBM researchers have demonstrated two-dimensional imaging of objects as small as 90 nanometers, a key advancement on the path of 3D imaging at the atomic scale. Such imaging could ultimately provide a better understanding of how proteins function, which in turn may lead to more efficient drug discovery and development. MRFM offers imaging sensitivity that is 60,000 times better than current magnetic resonance imaging (MRI) technology. MRFM uses what is known as force detection to overcome the sensitivity limitations of conventional MRI to view structures that would otherwise be too small to be detected. To achieve this, the research team developed specialized magnetic tips for their microscope, optimizing their ability to manipulate and detect the very weak magnetism of atomic nuclei. Conventional medical MRI typically operates on a scale at least 1,000 times coarser; even the most specialized MRI microscopy is limited to about 3 micrometers, or 3,000 nanometers. This achievement could eventually have major impact on the study of materials -- ranging from proteins and pharmaceuticals to integrated circuits -- for which a detailed understanding of the atomic structure is essential. Knowing the exact location of specific atoms within tiny nanoelectronic structures, for example, would enhance designers' insight into manufacture and performance. The ability to directly image the detailed atomic structure of proteins would aid the development of new drugs. 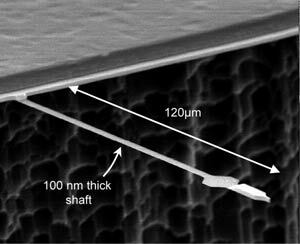 IBM Research has a distinguished history in developing microscopes for nanoscale imaging and science. Gerd Binnig and Heinrich Rohrer of IBM's Zurich Research Laboratory received the 1986 Nobel Prize in Physics for their invention of the scanning tunneling microscope, which can image individual atoms on electrically conducting surfaces. The report on this work, “Nuclear magnetic resonance imaging with 90-nm resolution,” by H. J. Mamin1, M. Poggio1,2, C. L. Degen1 and D. Rugar1 at IBM Research Division1, Almaden Research Center, San Jose, California and the Center for Probing the Nanoscale, Stanford University2 will appear in the April 22 issue of Nature Nanotechnology.